Here is an excerpt from the book "Victory & Virtue" and few pictures that I have added to the article. This portion was written by Guru Raj Kaur (Vancouver, Canada) relating to Yoga and Sikhi. I just thought it is another similar perspective that might be interesting to you all. "It is the Shabad Guru which unites us to the Infinite, through the meditation on the Siri Guru Granth Sahib. 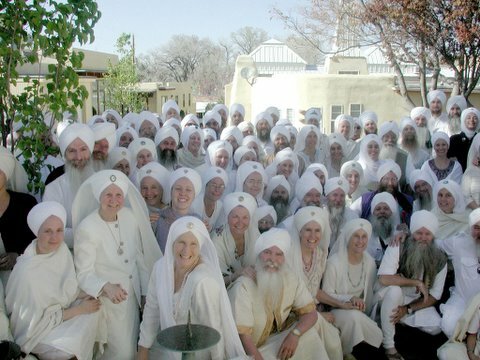 Kundalini Yoga prepares us to hear that Shabad. While compiling this book, we were aware that it would be read by Sikhs who chose to become Sikhs, as well as those who were born into a Sikh family, usually of Indian origin. It is historical fact that almost all of the people who chose to become Sikhs were inspired to do so through the practice of Kundalini Yoga and the practice of Nam Simran at Kundalini Yoga classes. I do not believe that this is a coincidence. I believe that by the Grace of Guru Ram Das, who sits on the Throne of Raj Yog, the teachings of Kundalini Yoga were brought out of India to the West to lead the souls whose destiny it is to walk in the Guru’s Way unto the Guru. I believe that it is important to maintain the practice of this "preparation". We also recognize that it is the Grace of the Guru which leads us unto liberation. Kundalini Yoga is the householders yoga. It is the Yoga of Awareness, of Charhdi Kala. Guru Nanak admonished the yogis of his time that they were on the wrong path, teaching them that leaving their families, leaving this world and practicing austerities would not merge them with God. This is true. He did not teach that yoga itself is bad and in any way incongruent with the life of a Sikh. In fact, the internal process of merging with the Infinite that is described in the Siri Guru Granth Sahib is identical to universal principles of union with God which were taught by the ancient yogis. A Sikh does not do yoga to "earn" his or her liberation. 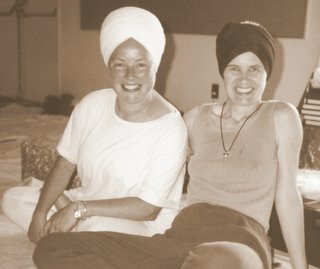 A Sikh uses the techniques of Kundalini Yoga in the same way that s/he would take a bath in the morning, or be conscious of how s/he maintains the body purely, eating a vegetarian diet, not partaking of tobacco or alcohol. In other words, a Sikh prepares this sacred body temple as purely as possible to bring the Holy Naam, the Holy Gurbani into it, to do justice to that Sacred Word. However, Kundalini Yoga prepares not only the physical body, but all of the Ten Bodies of which this magnificent human system is composed. I see no contradiction to a life as a worshipper of the Siri Guru Granth and my Kundalini Yoga practice. There is nothing in the path of Kundalini Yoga which in any way contradicts what is taught in the Siri Guru Granth. It has been my personal experience that Gurbani Kirtan and developing a relationship with the Siri Guru Granth Sahib has given me the bliss and grace of life. 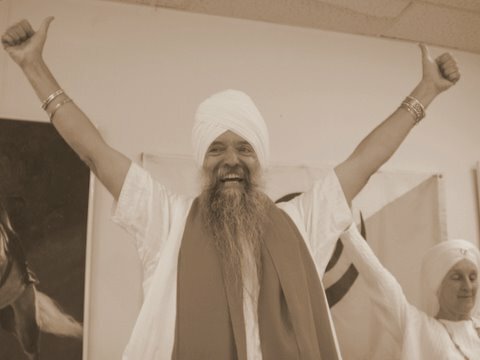 However, it was and continues to be my Kundalini Yoga practice and teaching which keeps me in Chardi Kala and continues to remind me to seek the Guru’s Feet as my refuge. I truly believe that it is the Miracle of Guru Ram Das that the ancient teachings of Kundalini Yoga were offered to the Sikhs to keep them in Charhdi Kala. How else can we explain the miracle of so many Westerners coming to the feet of Siri Guru Granth Sahib through the practice of Kundalini Yoga? SSA, I have a question, Do American or let us say Western Sikhs feel they are more of a SIKH then simple PUNJAB SIKHS, as they I mean the PUNJAB SIKHS live in their way of life without the HI-FI equipment of knowlegde or Comforts with utmost corruption in country like India where depending on the circumstances they have to be diplomatic and THEY live their lives 7 to 7 with great deliberation to be able to earn food just for that day or week. I know 99% of western sikhs probably do not think, but when you write only in context to them it feels like that. Also just like in India, here too men and women talk and gossip and do lot of other wrong attributes may be daily or weekly basis, but are we judgemental about the poeple in India more or about western SIKHs.Also I believe along with GURU RAM DASJI ,ALL our GURUS, are on throne of HIGHEST YOG of IMMORTALITY. PLease I feel they are left behind in your articles. MY one more question is are you able to identify my computer since I wrote this. You may delete this comment if you like. I also want to say that just like western SIKHS were found by YOGIJI so I hope some great YOGI erupts in INDIA whom the PUNJAB SIKHS find and follow. About being judgemental about Yoga, when poeple do not even know what it is how can you give importance to their judgement, whether they are HINDU or SIKH. I’m writing this not to criticize but to foster better understanding. What physical activity we use to relax and calm our body as individuals is a private matter. But when a supposedly religious organization displays a virtual obsession with actively promoting and eulogizing a particular form of exercise in all its public transactions â€“ it runs the risk of being perceived as cultivating a bias and eroding the doctrinal purity. When Sikhi is neutral to biomechanics, athletics and exercise â€“ why make it non-neutral and partisan? Why create a gulf where none exists? Didn’t I hear someone say they were working to bring people together? What I don’t understand is: what is the compelling reason – why is it imperative to mix the Sikh spirituality with physical fitness, mind-relaxing techniques and Yogiji’s personal opinions? Why do they need to be merged â€“ why can’t they stay in separate domains on separate forums? Suppose in the future, someone comes along and helps create beautiful Sikhs through homeopathy or snowboarding â€“ would we have to once again gladly acquiesce to the twisting and turning of our doctrine so that homeopathy and snowboarding can be incorporated into Sikh theology. I have a question. Why does it appear East Indian Sikhs are sensitive to matters of Sikhism and the Guru in relation to the West? Or is it that American Sikhs are equally ready to defend and compare notes. Maybe it is just me. Is there really any such thing as a good or bad Sikh? Rules and more rules, do this, don’t do that, wear this, don’t wear that, move like this, don’t move like that….it is all dogma and there is no breath in dogma. Now dharma on the other hand, well…dharma brings life. The practice and service of one in relation to the Truth. It’s all quite relative for it’s in the nature of the individual in which character is revealed. Does one need to have permission to move or pray, does prosperity or poverty govern ones heart in seva, does east or west do it better, does righteousness clarify itself in debate? So much time on rules and regs, rights and wrongs? Is there a proper measuring stick of Sikhism to determine who is more Sikhi on one side of the ocean or another? Isn’t it just a grand thing in and of itself to serve and be in devotion to God and Guru? The common denominator shall always be the heart, the truth of the heart belongs to the territory of the Divine, and in the territory of the Divine lies the Mother of us all, knowing Her children love to squabble. She says “work it out” and so….a check/checkmate upon the blog. Sat Shri Akal to everyone! Great work is going on by Gurumustak Singh i must confess. I really liked the picture of all white turban sikhs(menandwomen)and Gurudwara in the back. it looks very peaceful. This is how I am sure sikhs looked like in the darbar of Shri Guru Gobind Singh Ji with all KESRI turbans, swords hanging down the waist, loose flowing beards, thick KARAS, with thousands of horses outside. Man…I Miss that. It’s time for us sikhs to stick together and not to criticized each other. As long as we have our faith in “One and only Shri Guru Granth Sahib Ji” we are one and same. what u guys think? Sat Shri Akal to everyone ! Wahe Guru Ji Ka Khalsa! Wahe Guru Ji Ki Fateh! The One Light resides in each of us. We are One with God and Guru, regardless of our caste, country of origin, even religion. For that Infinite Wisdom that creates us all, these barriers are not seen. I was really concerned at reading some of the comments posted here that there’s still this differenciation between punjabi sikhs and western sikhs. I am a western and also a mexican. If somebody wish to categorize me from that, is fine. But does that really define me before Guru’s eyes? The only ‘concept’ (to put it this way)that I know and that Guru’s wisdom keep telling us is that we are infinite and timeless by nature. Those could be two adjectives that would likely suit me -and all of us- better than the others. 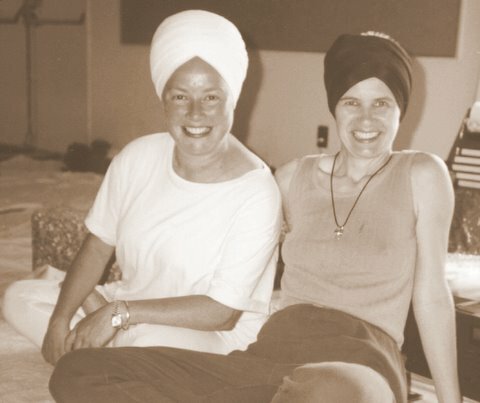 I was brought to Sikh Dharma by the experience of Kundalini Yoga. I do not particularly think that either one bring the other or viceversa. In my experience, both have the amazing grace to bring consciousness to anyone who practice them. When we say ‘we are working to bring people together’, it’s not that we are trying to either convert non-sikhs to sikhs or to convert sikhs into yogis. There’s no such thing. The true purpose is to bring people together in consciousness, so we can lift up from our insecurities, our ego, and our limited perception of this game of life. And from this point, it’s similar like sitting in the Guru’s court or in the Guru’ka langar, where we can be fed from that infinite truth without looking into our differences and sitting at the same level. I had the blessing of living a year abroad in Vancouver. This was in my early days as a sikh, when I had short hair, starting to let it grow, and knowing very little (in experience) about sikh lifestyle. By coincidence or by destiny, I had the chance to experience very closely the life of ‘western sikhs’ and its relationship with ‘punjabi sikhs’. I learnt a lot of things from many punjabi families, I interacted with them in a way that -because of my outer resemblance to punjabis- was heartening and familiar. Mexican and punjabis families are very much alike. My experience from observing the dynamics between ‘white siks’ and ‘punjabi sikhs’ killed all this prejudice that is being talked about. I saw a beautiful relationship that meets at the heart and bows at the feet of the Guru. Kundalini Yoga is not just physical exercise, it’s a whole based system. I’m sure Gurumustuk has writen about it hundreds of times in his blog. I would suggest to the people that still have doubts about what is kundalini yoga to practice it, experience it and then make a judgement. There’s nothing to lose! Let me write some bonus. Nothing new. Sikh spirituality has Ek Ong Kar in its foundation. It means We are One. I am with Mohinder Singh that we should really strive to see what bring us together instead of what divide us. And this is not just among us as sikhs but as humanity. May God and Guru bless us all cyber sangat! Sat Nam. Great post Gurumustuk! There is so much learning going on here about Sikhi and Yoga, and it is all really inspiring. Talking about building bridges between cultures, I just saw this in media reports and thought would make a funny quote of the day! and better yet, how about yummy Yogi Tea, mangoes and Wahguru bar! I think we all agree that yoga is fine, just as going for a jog in the morning and doing stretches, aswell as other exercises to help focus the mind. I find that going for a jog in the evening is beneficial to me to waking up early for amritvela as it gets the blood flowing. Similarily Yoga can also help people clear there mind to concentrate more. That being said its not a part of Sikhi, but it is a technique that can help with ones Sikhi. to annonnymous, sikhi is a path of prema bhagti. Serving and remembering god with every breath. Our Guru’s gave some specific hukams so its not just rules and rules and some more rules, what our gurus said will be followed by those who are truly in love with the guru’s who gave those hukams. Sikhi is not a path where you can say it just matters what is in my heart and I dont have to listen to hukams. Sikhi is a practical religion with practical guidelines to help one progress spiritually at the fastest possible pace. If people r obsessed with Kundlani yoga. Then Y don’t they learn other types of yoga like ‘Bhakti Yoga, Karma Yoga, Patanjali’s Yoga, Jnana Yoga,Hatha Yoga, SwaraYoga, Raja Yoga, Kriya Yoga & Mantra Yoga. This is not a criticism but I am really concerened abt the fundamentals that drives people here towards Sikhism because in future u will come across no. of people that will try to shake ur foundation so u need to have sound and strong basics.Their r so many ridiculous questions that u will find people asking that some of u will loose ur cool and for some so called brave hearts first thing that will come in their mind will be “Is it worth being a sikh?” after this. So I feel every Sikh Should have answer to “y I am a Sikh?” , “y do we look different?” etc. Do u know y i am asking u to do this because u have to come across these type of questions “h**p://o3.indiatimes.com/sikhism/archive/2006/01/10/407866.aspx”(Times of india is leading news paper of India) which were posted by some Mr Singh (i dont know y people like to be anonymous).The most upsetting thing was that their were around 150 replies but no one was able to answer all the question accuratly which i feel is shame on us. Some of these r the most ridiculous questions but I feel we should have a sound knowledge of our fundamentals and basics so that we can give a strong reply to who so ever asks and what soever asks. I don’t have words how to appreciate u people the way ur following traditions of Sikhism Specially after seeing this site. But I have some concerens so i have written all these things because Sikhs in punjab have created mess but I don’t want u to do this in future. Regarding Yoga I would say do an EXPERIMENT “Take some Yogi guys to close room where u do yoga and try cure someone who is suffering from flue or something as such with Yoga exercises and see result next day ,u all will need a CURE so ‘moral’ of experiment is, do yoga in open AND and dont follow Yoga blindly beacuse i have seen people doing yoga in rooms in BBC23HO VIDEOS. Because if some one is uffering from flue Yoga can be devastating specially when u do breathing exercises. Another thing I have greeted with “BOLE SO NIHAL” it is not a mistake becausse u know what comes next and when u will ‘say’ that that means u have accepted my greeting.’I hope i have not upset some egos’. and regarding questions asked in the site in site I can answer all those but First I hope all of u will try and if u have some other u can ask it from me any time. I think this is a case of making a mountain out of a mole! It’s amazing how western Sikhs using Yoga creates such a commotion when all it is doing is letting them get closer to the Guru! Maybe they just want to share the knowledge and want many other Sikhs to experience what they are and have experienced by using Kundalini yoga? There are much more crazy things that are going on in the world of Sikhi like corrupt leaders, committees, our youth losing their identity and roots of Sikhi but we are here complaining about how Western Sikhs are using yoga! Lets get a grip and let bygones be bygone if you dont want to do yoga dont do it thats your choice, if you do then do it simple as that but dont criticise just because “You” dont like or want to do it. We as Sikhs as for “Sarbat da bhalla” everytime we do Ardaas that means everyone and anyone so lets live by this command! Waheguru ji ka khalsa waheguru ji ke fateh. What appeals to people in the West who have become Sikhs is the whole lifestyle taught by Yogi Bhajan. Yoga, meditation, eating healthy, not drinking alcohol, etc. ; these things are a big part of the experience they have had that uplifted and inspired them and opened their minds to new realities and understanding. Yogi Bhajan taught these things not to make them into Sikhs, he shared these ideas and technologies to help people. He did not sit and teach only Yoga, he taught people how to live healthy happy and holy lifestyles (hence the name 3HO). It was not just for Sikhs, it was for everyone. But all of the philosophy and wisdom he shared was threaded through with Guru’s Teachings and the perspective of a true Gursikh. By the hand of the Guru, some who learned from him also saw the Sikh Religion and their souls found (or came back to) their path. Who is going to understand what a Sikh is through just an intellectual idea? It must be experienced. Just meeting a true Gursikh can be all it takes. Philosophy and intellectualism are worthless and meaningless without the practical experience of them. It has to be lived to be real. Yoga,Â in all forms, isÂ inconsistent with Gurmat – including recreational yoga (bereft ofÂ mantras).Â As for recreational activities, Guru has guided them to indulge in various sporting and martial activities. There is not even a shred of evidenceÂ from 1469-1708 to suggest that Guru and Sikh practised any form of yoga – recreational, kundalni included – in their daily lives for healthy living. 114704842224720106 - Hahaha.....Narayan Singh having fun riding his bike.